Do you love your country as much as you love fonts? Are you a Comic Fanboy? A CFB with a soft spot in your heart for those spangled superheroes willing to fight for the American way of life? Do you joyously celebrate the 4th of July? Do you admire the Pledge of Allegiance, Old Glory, Lady Liberty, the Star-Spangled Banner? Do you hum the National Anthem on your drive home? Do you put country first? 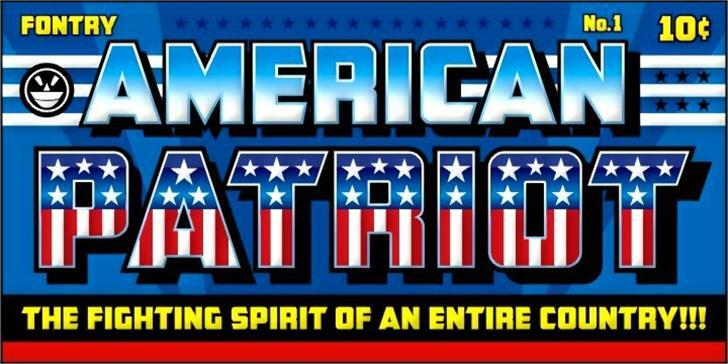 CFB1 American Patriot SOLID 2 Bold is a trademark of The Fontry. CFB1 American Patriot SOLID 2 Normal is a trademark of The Fontry. CFB1 American Patriot SPANGLE 2 Normal Italic is a trademark of The Fontry. CFB1 American Patriot SPANGLE 2 Normal is a trademark of The Fontry.